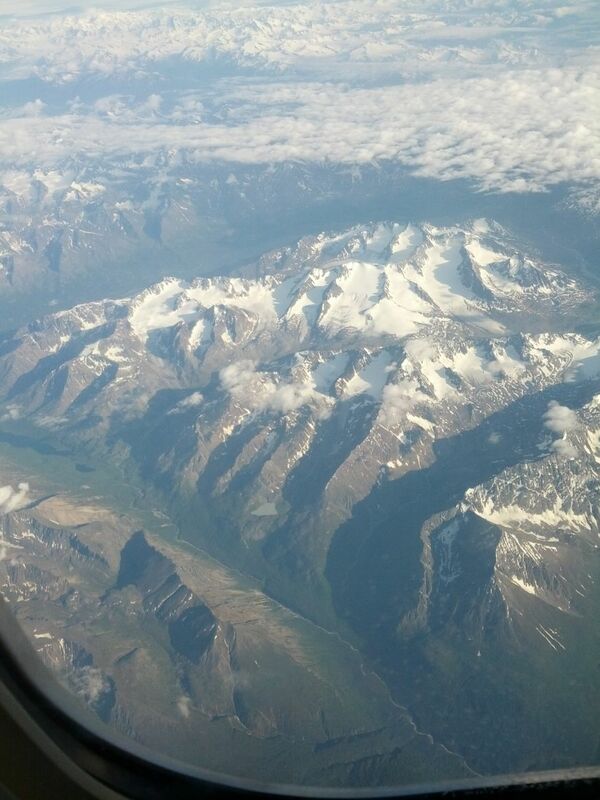 It's hard to believe that some of these mountains are no more than a dozen miles away from Anchorage. Anyway, the flight landed without issue, and with my personal time already past midnight, I headed to my room for the night and went to bed. 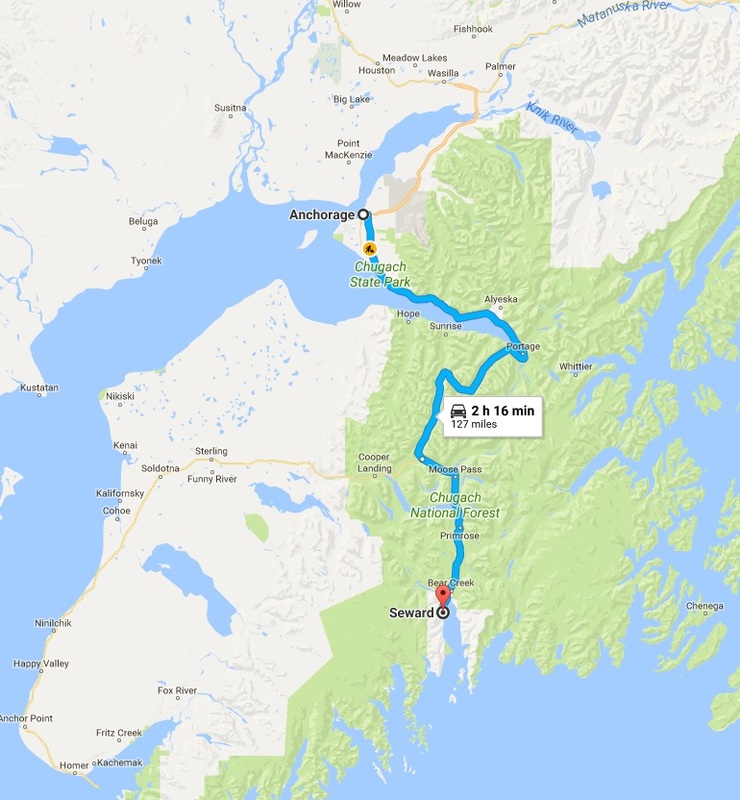 I was up early in the morning though, picking up my rental car and heading off to the town of Seward, located 120 miles to the south on the Pacific coast. 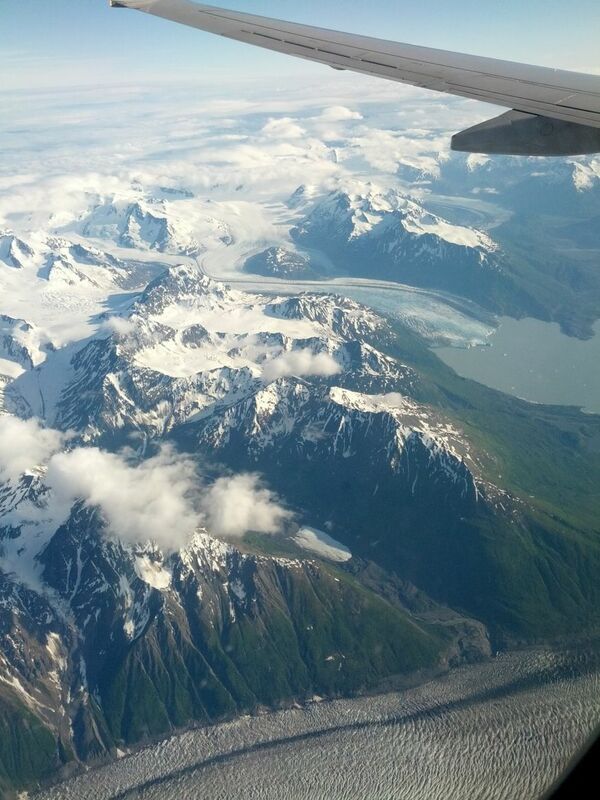 I would be back to Anchorage the next day to have a chance to see the sights. 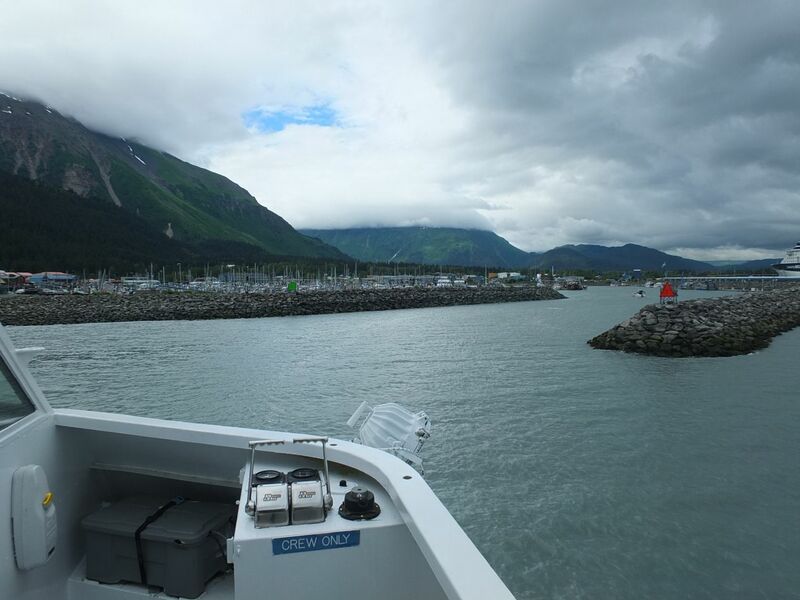 On this day though, I had a marine tour booked to explore Kenai Fjords National Park and needed to ensure that I was there in time to make the boat. 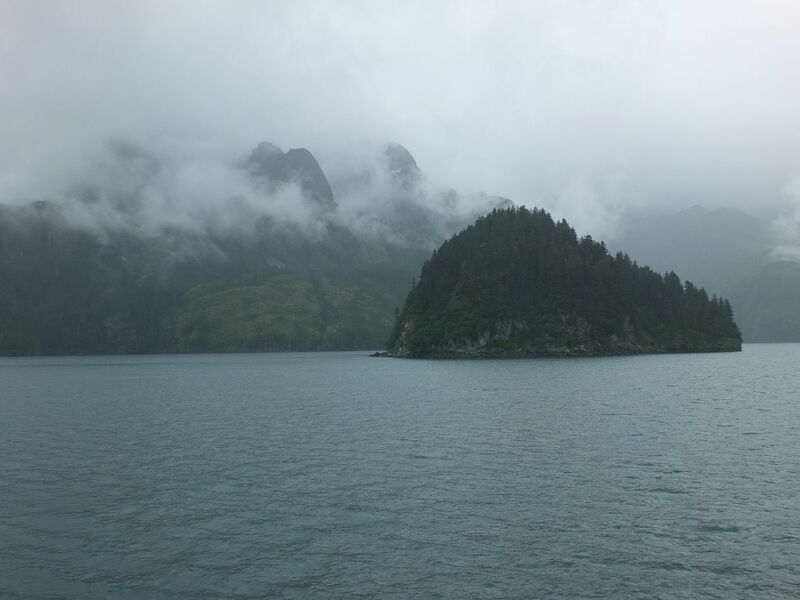 This was a gray, rainy day that I imagine is pretty typical along the coast of Alaska. 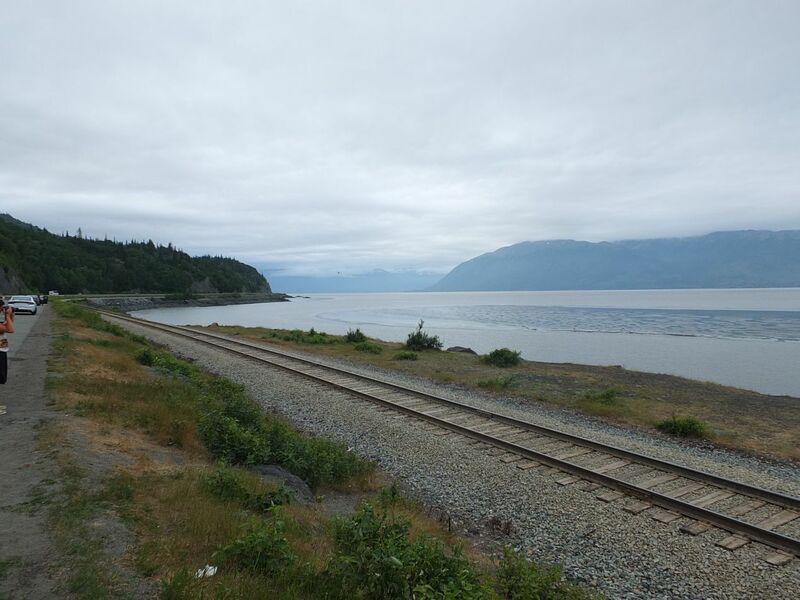 The road south from Anchorage parallels the tracks of the Alaska Railroad, and yes, trains do still run on it throughout the year, even in winter. 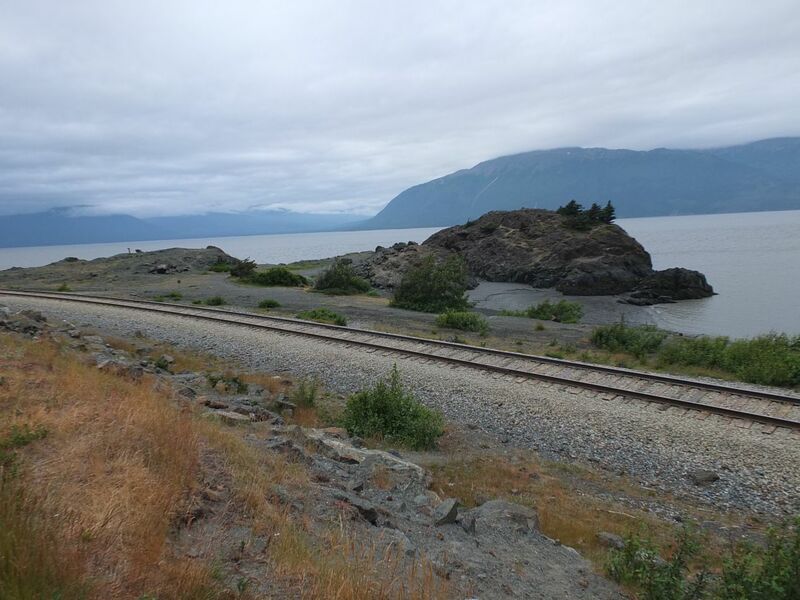 The coastal road offered up plenty of views of Turnagain Arm, a small channel of the Pacific that twists and turns between mountains on each side. 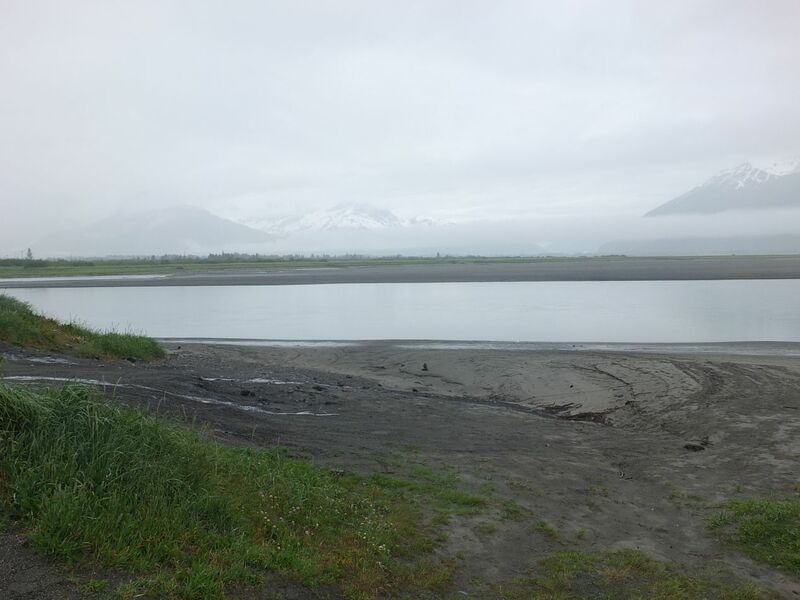 Further south of Anchorage, down near the head of Turnagain Arm, those mountains were still topped with plenty of snow in late June. It was difficult to see them at times due to heavy rain, and that prevented me from getting more than a handful of pictures on this drive. 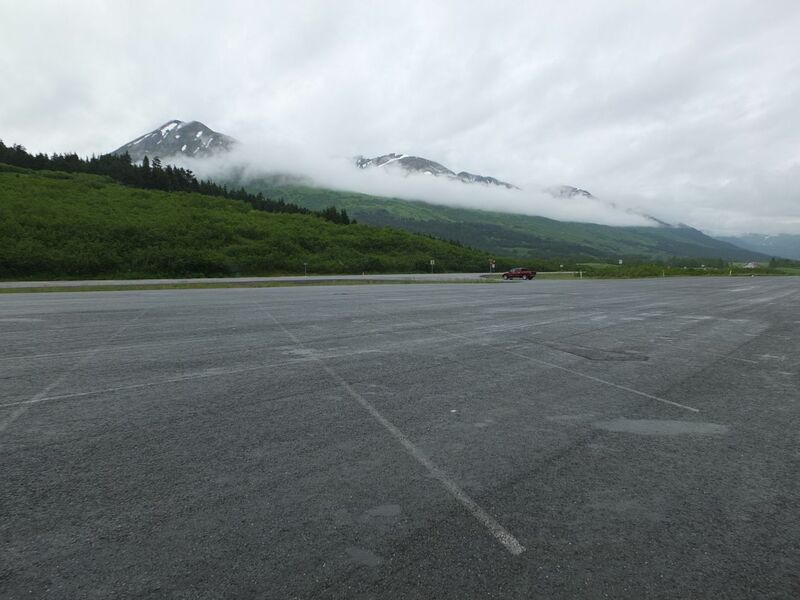 I arrived in Seward around 9:00 in the morning, fortunately in plenty of time to make the scheduled tour. 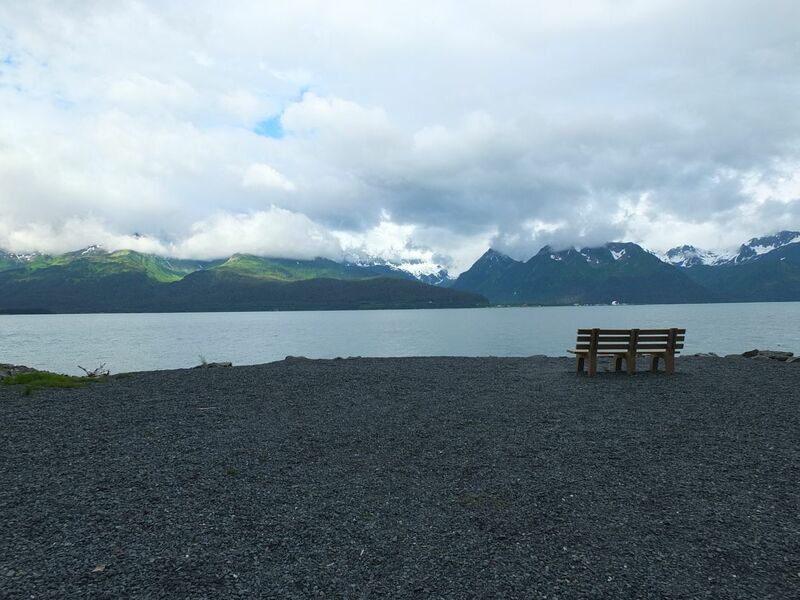 Despite the presence of modern tourism, Seward remains very much a fishing town at heart, with commercial fishing records prominently listed in the town square, a monument to sailors lost at sea, and plenty of seafood restaurants ready to sell the catch of the day. 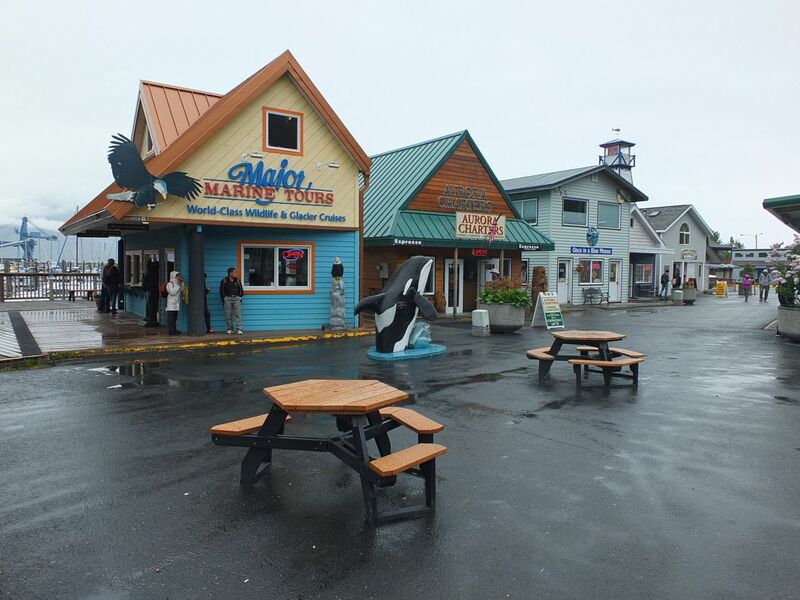 Maritime tours are the most popular attraction for visitors, along with an aquarium for children that I wasn't particularly interested in seeing. 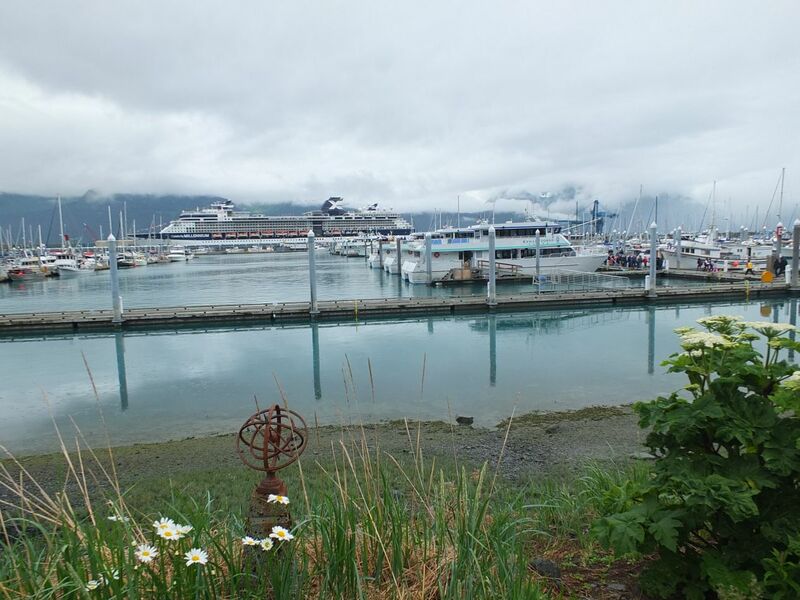 The harbor was full of boats when I visited, including several humongous cruise ships, and the views of the sheltered bay to the south of the town were breathtaking. Picturesque though it might be, Seward is a small town of 2500 people without too much going on, and the main reason to travel here is to see the surrounding natural scenery. 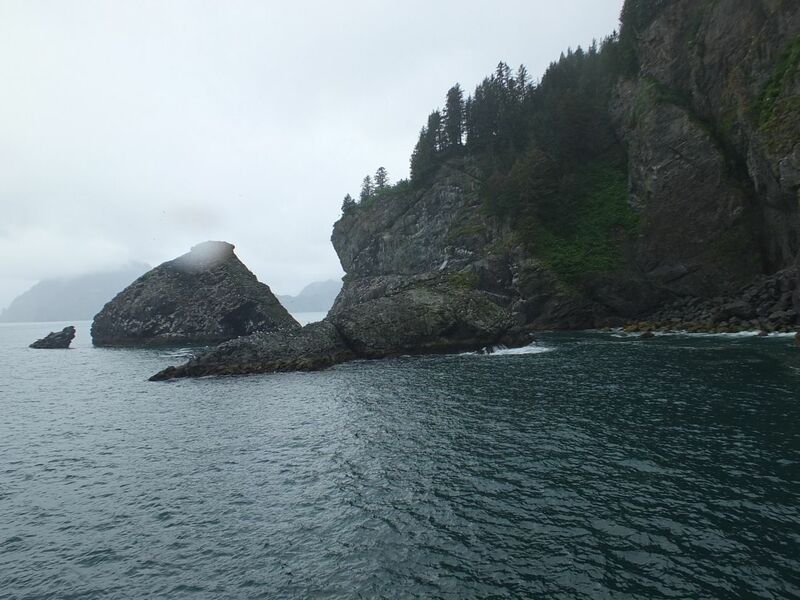 Kenai Fjords is one of the youngest national parks in the United Statues, and it was specifically created to protect the marine ecosystem along the southern coast of this part of Alaska. Kenai Fjords has no trails and no roads, and in fact mostly consists of a glacier that's in the process of slowly melting away. 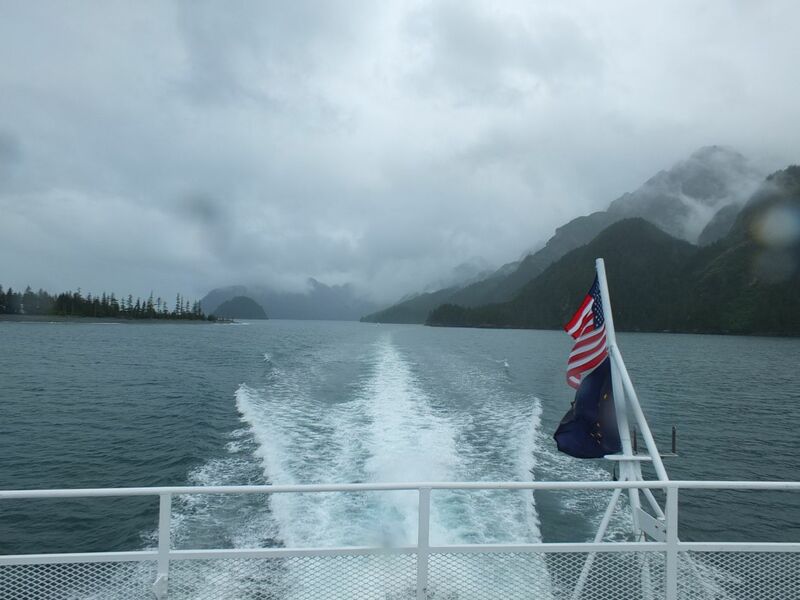 In order to see the sights of this national park, visitors need to book some kind of marine tour, unless they're lucky enough to have their own seagoing craft. 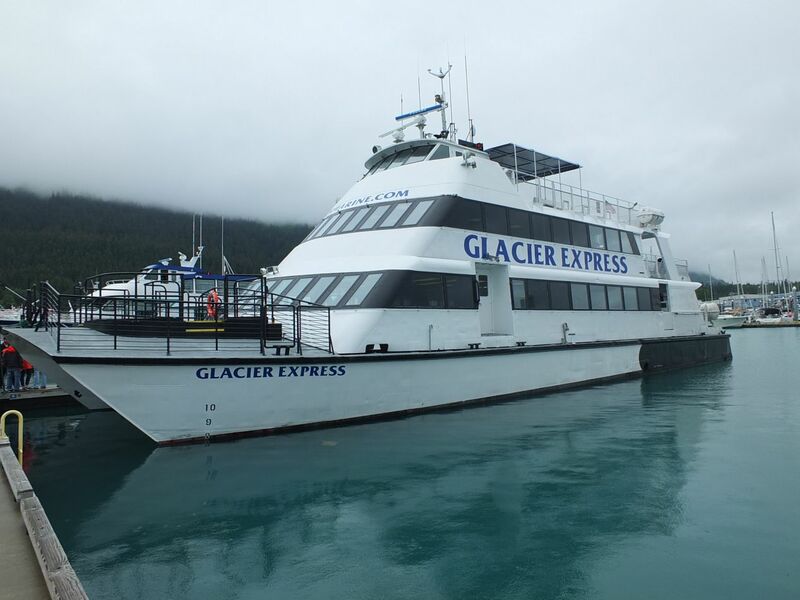 I was on this boat named the Glacier Express, off for a six hour tour in the hopes of seeing whales, seals, eagles, and the aforementioned glacier. The weather continued to hold overcast and intermittently raining as the tour got underway. 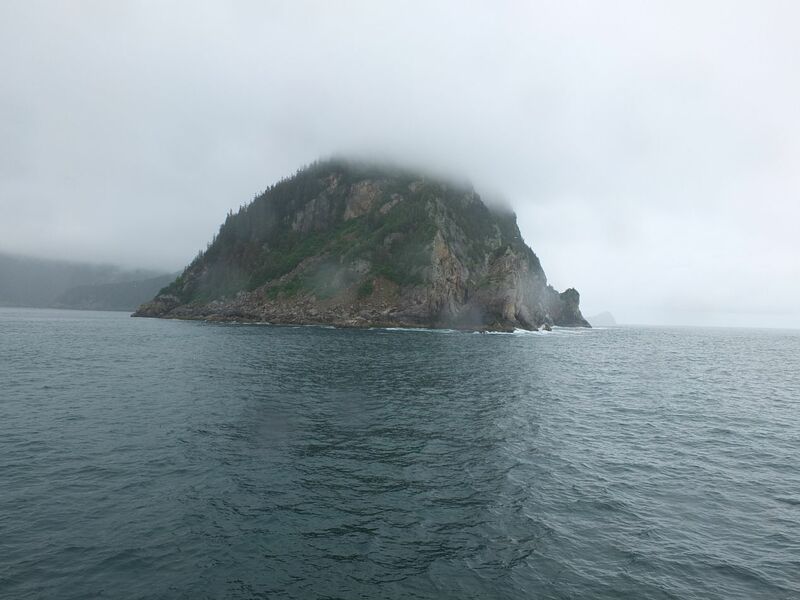 Resurrection Bay was spotted with small islands, each one covered with evergreen trees, and everything was shrouded with mist and clouds. 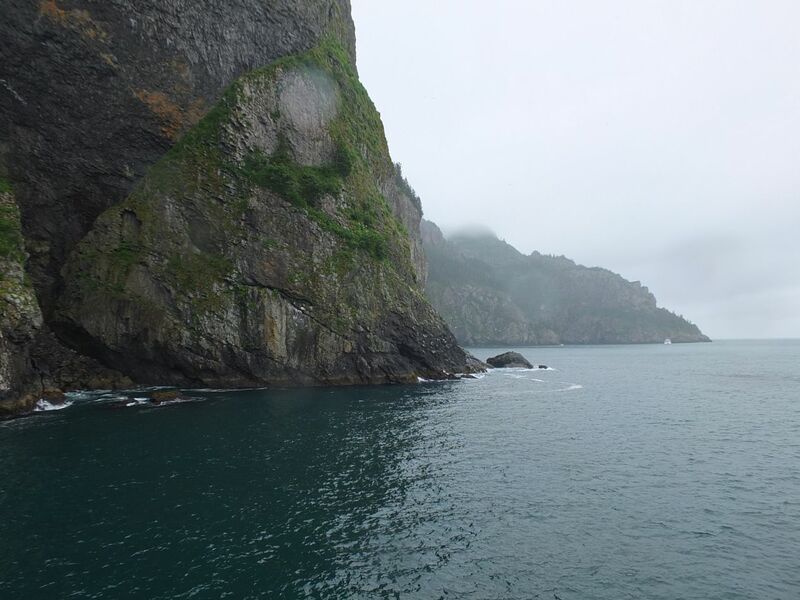 The scenery looked like something out of The Lord of the Rings, which makes sense since coastal Alaska has a climate similar to New Zealand's southern island where much of the trilogy was filmed. We had good luck on this trip, and almost immediately began spotting wildlife. 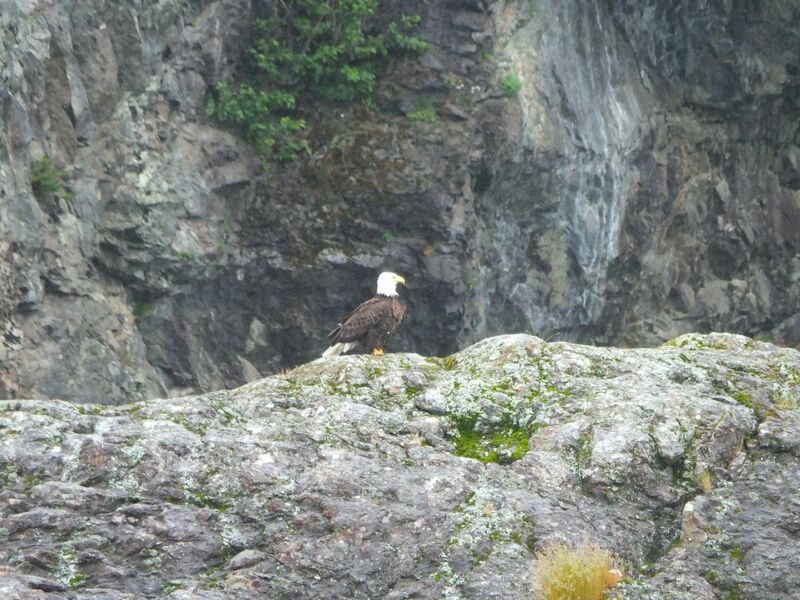 There was a bald eagle perched out on top of one of the rocks, with the distinctive white crest of feathers helping to identify it. I don't know very much about birds, but one nice thing about being on a boat with a couple dozen other people is that someone else can point these things out to you. 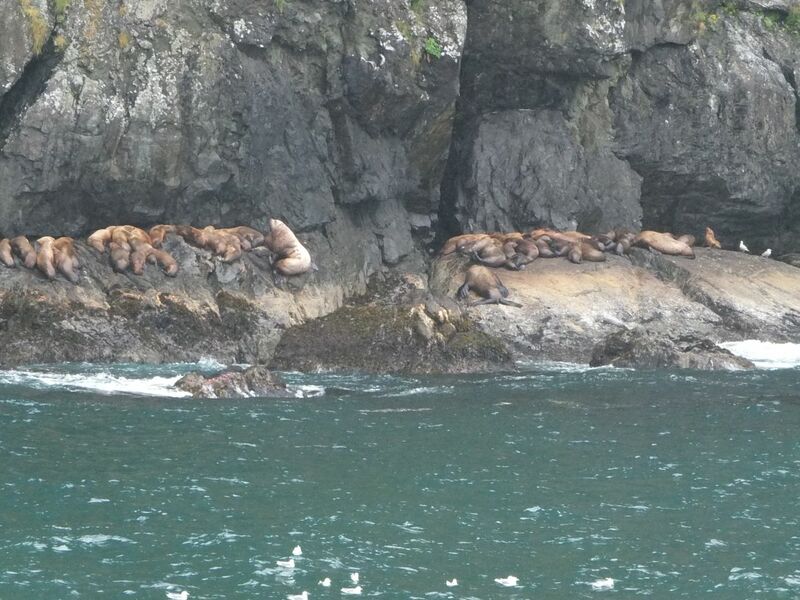 Next up was a large group of sea lions, who would have been sunning themselves on the rocks if there had been any sun out this morning. 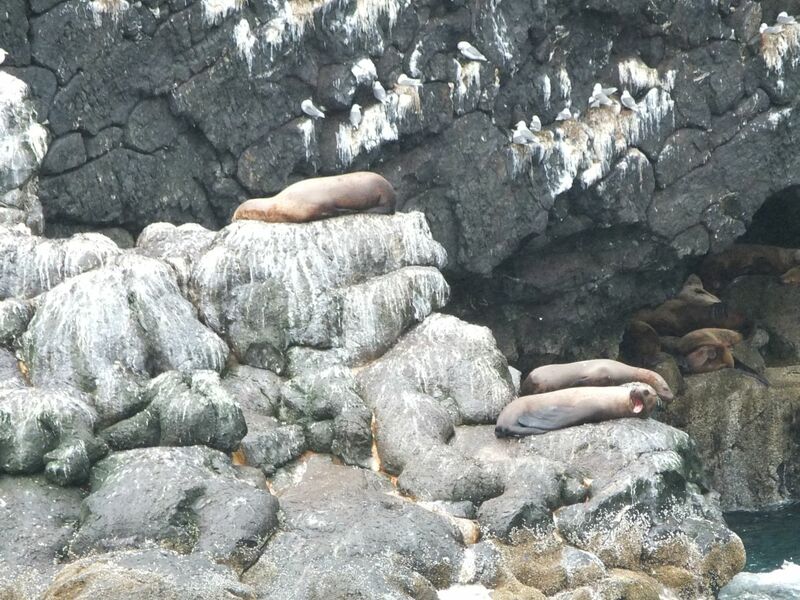 Dozens of them were laying next to one another, with their brownish-gray coats blending in surprisingly well with the rocks at a distance. I managed to catch one of them in mid-bark above. 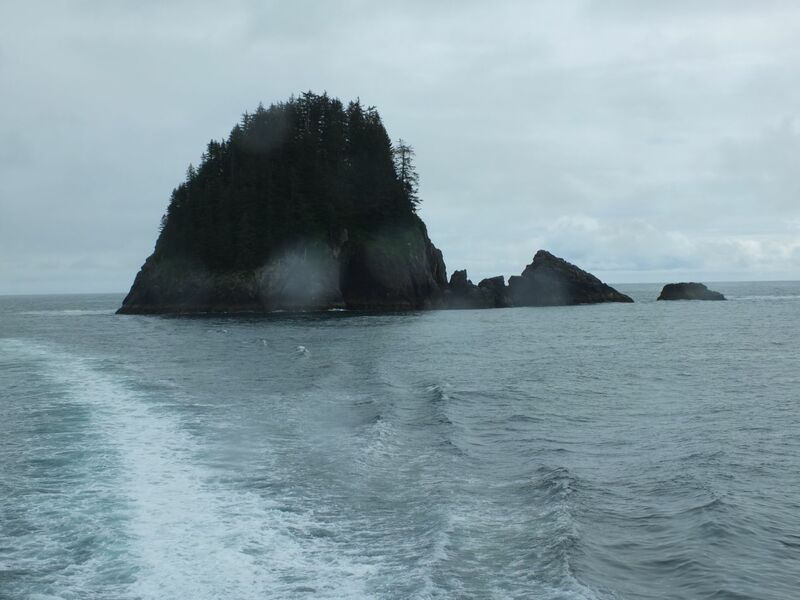 They were surrounded by untold thousands of birds, and of course that meant the leavings of birds as well, with white marks staining the rocks. Nature isn't always the cleanest place. Further ahead was another species of bird with black feathers on the head and back, along with white feathers on the underbelly. This was a type of bird that I'd never seen before, and again, I have to confess that don't know that much about birds. 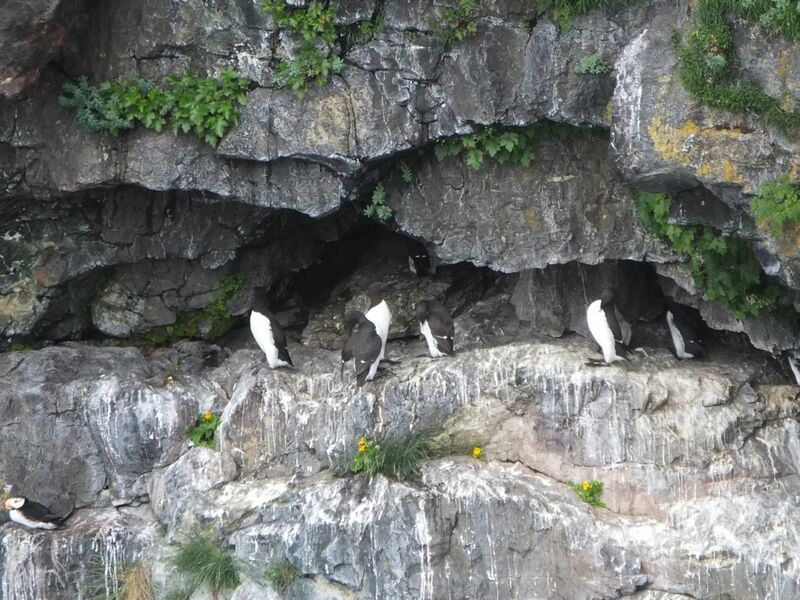 A Google search indicates that they are known as the "common murre", a penguin-like bird that lives along rocky coastlines in cool climates. Pretty neat, even if they weren't what I had come to see. 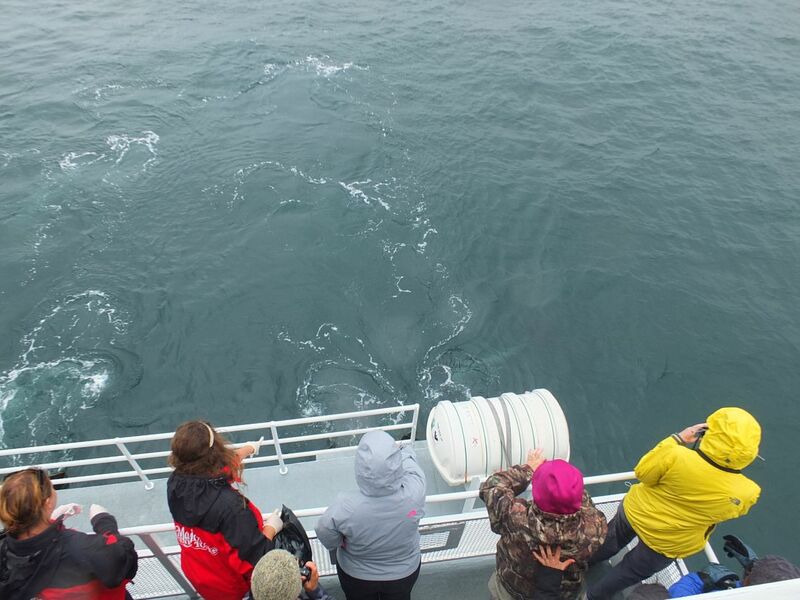 Everyone on board was hoping to see whales, and fortunately we were lucky enough to come across a whole pod of them. 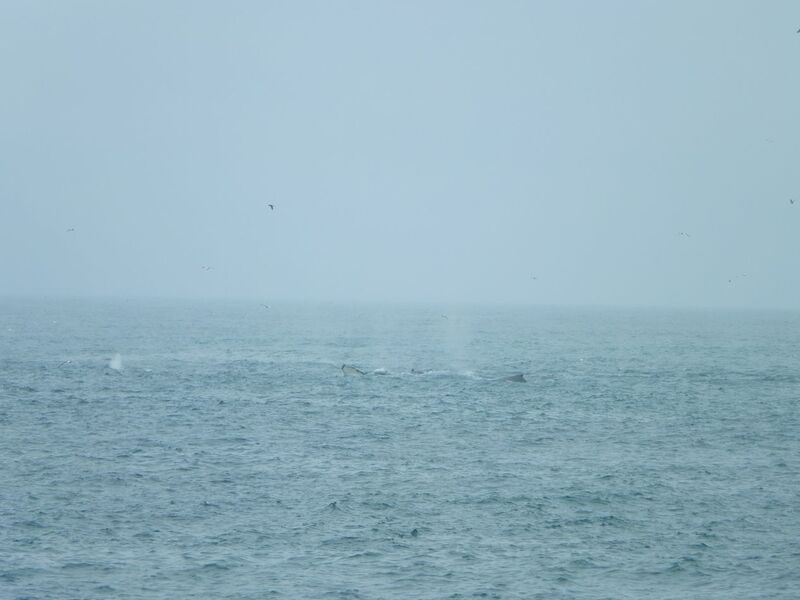 These were Humpback whales, who were not bothered at all by the rainy conditions and kept poking their tailfins out of the water to give us a peek every time they came up for air. I was surprised by how close they were willing to get to the rocky coastline, given the size of the whales, but I guess they knew what they were doing. No beached whales here or anything like that. Photographing whales can be tricky due to the fact that they remain submerged almost all of the time, and the brief moment when they surface for air only reveals a small portion of their bodies. 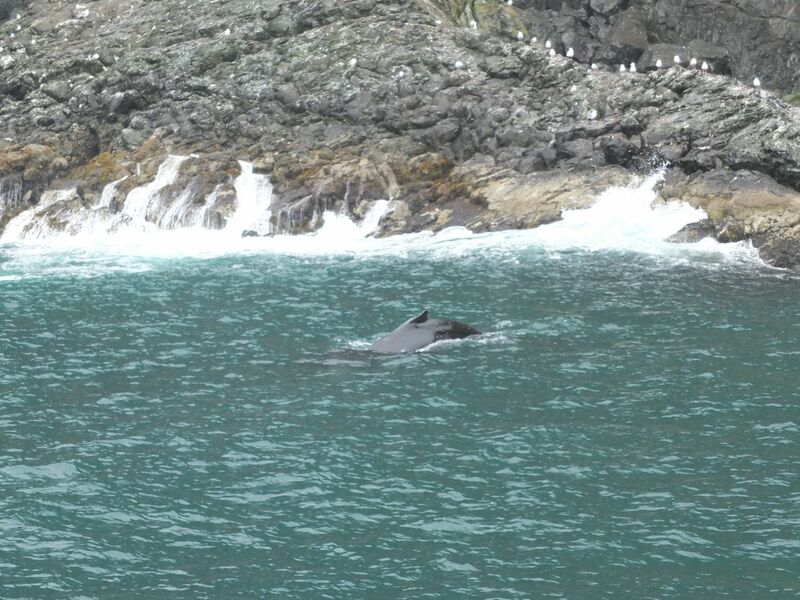 The whales don't exactly give a warning when they're about to come up either. They are easier to track by the sound that they make when breathing through their blowholes, a loud burst of air that sounds like a puff of steam being released. We had about a dozen of them traveling together in a group, and the noise that they made was constant. The driver of the boat fortunately turned off the motor to let everyone hear the distinctive sounds. It's too bad that this was the point in time when the rain was hardest, making it more difficult to see and capture these animals. At least I managed to get a clear view of that tail in the last picture above! 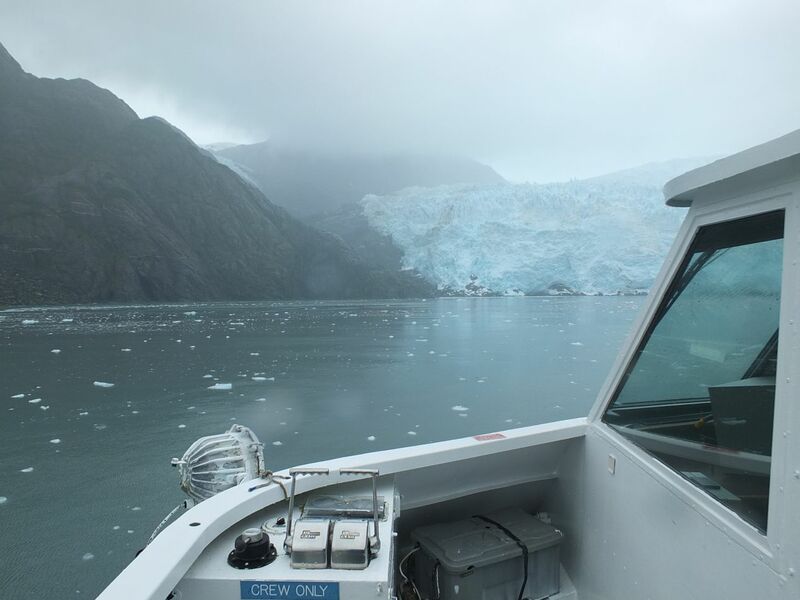 Our boat began heading out into open waters next, making its way further to the southwest en route to the closest glacier. 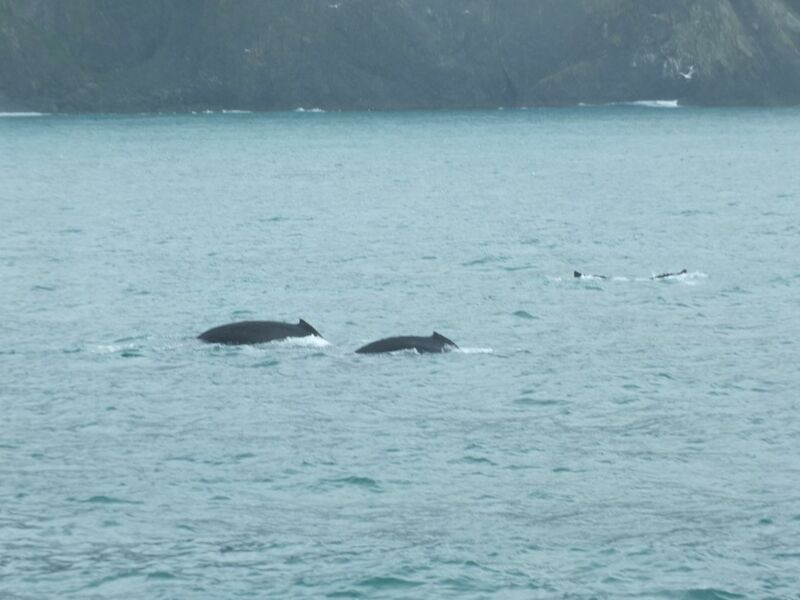 Word soon spread that someone had spotted another pair of whales, this time from another species. There were two orcas / killer whales heading near our boat, the same species that used to serve as the prime attraction for Sea World. Unlike the Humpback whales from earlier, the orcas remained submerged instead of coming up for breath every minute or so, and they were much harder to spot. 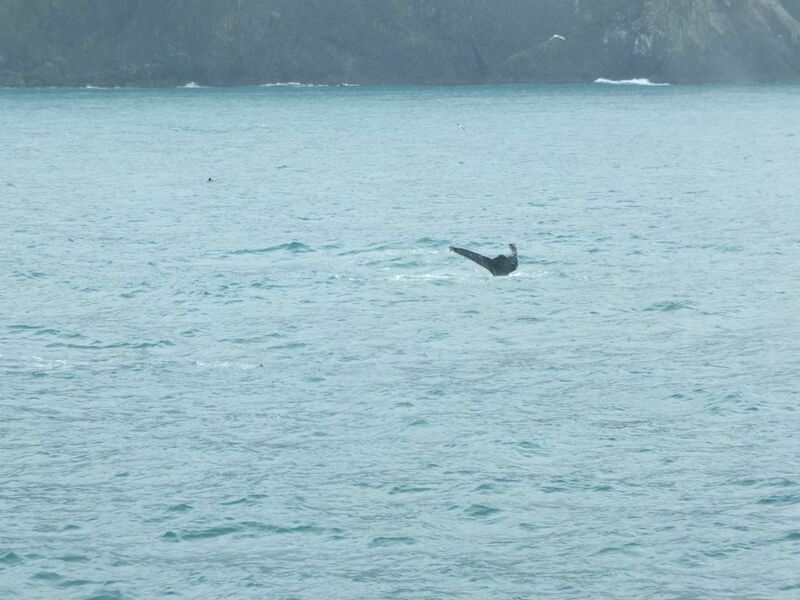 I wouldn't have seen them at all, except that they happened to pass almost directly below our boat. I snapped the two pictures above as quickly as I could, and just barely managed to capture them as they swam past, still submerged under the water. 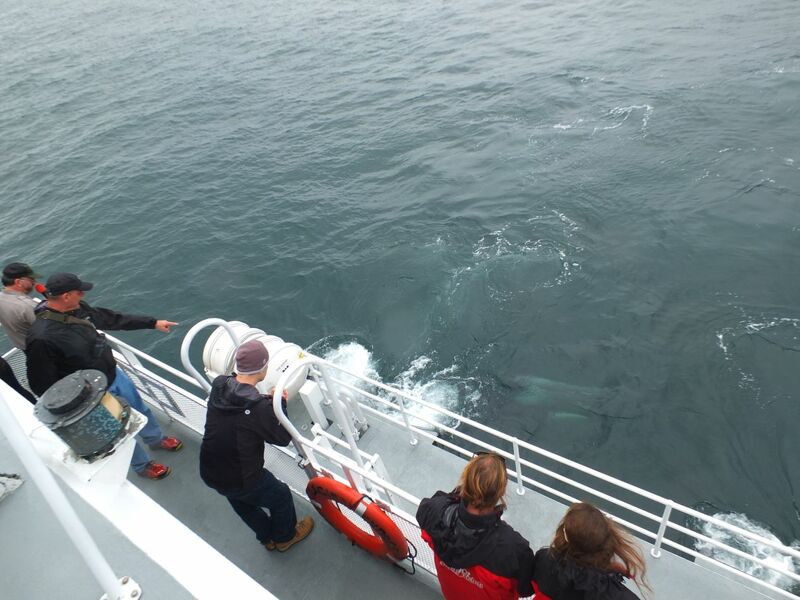 The second image is a little bit easier to see, assisted by the other passengers pointing to the underwater orcas. 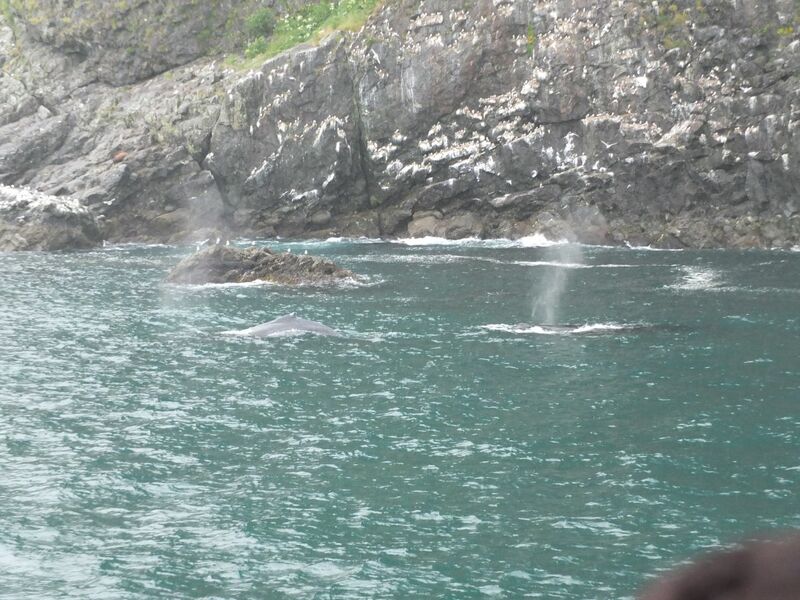 This was a real stroke of luck; short of the whales jumping out of the water for easy photography (which none of them were doing), this was the best kind of shot I was going to get. Pictures of killers whales while they were still underwater! Not bad for amateur photography. 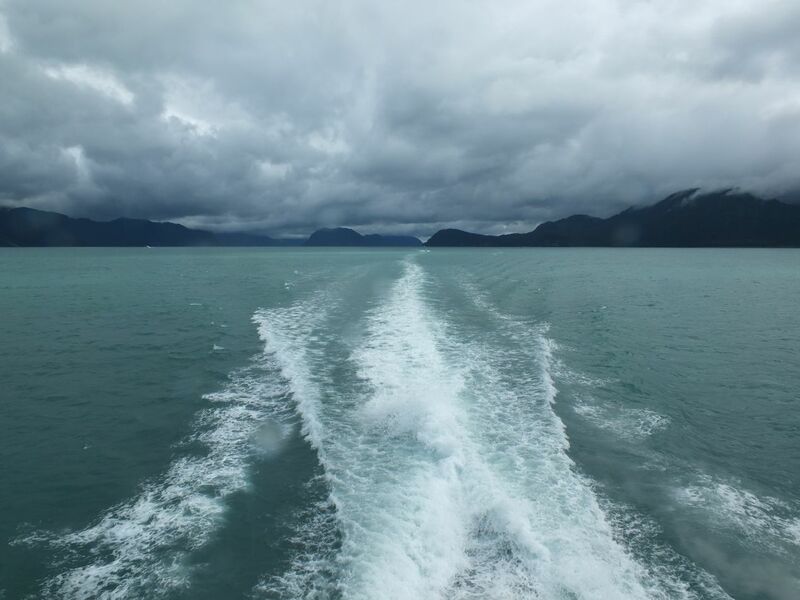 We spent the next half hour to an hour traveling through the open waters of the Alaska coast. 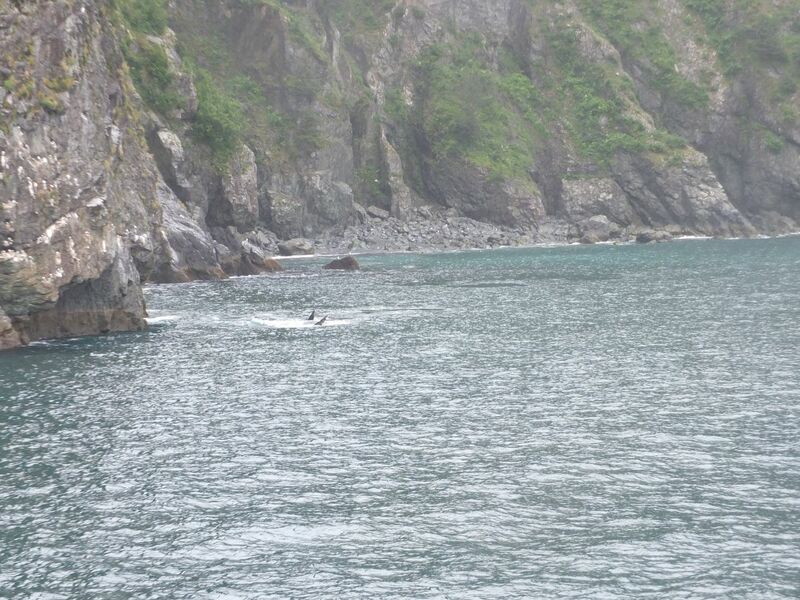 These are naturally choppy seas and many of the passengers became quite seasick, myself included. While I managed to avoid losing my lunch, this was not the most pleasant experience for me. I kept my eyes closed and did my best to breathe deeply and evenly, with a stomach that felt like it was doing somersaults. Next time, I'll made sure to purchase those pills that they sell to help calm seasickness. In the meantime, our boat eventually made its way into Aialik Bay, where the sheltered environs immediately resulted in a calmer passage. The weather here became even more foggy, perhaps influenced by the great mass of snow and ice that we were steaming towards. Up ahead was the Holgate Glacier, part of the Harding Icefield that comprises most of Kenai Fjords National Park. I had previously seen glaciers while traveling through the Canadian Rockies a few years earlier, but this was the first time that I had seen one located along the coast. Glaciers don't look the way that one would expect when seen up close. 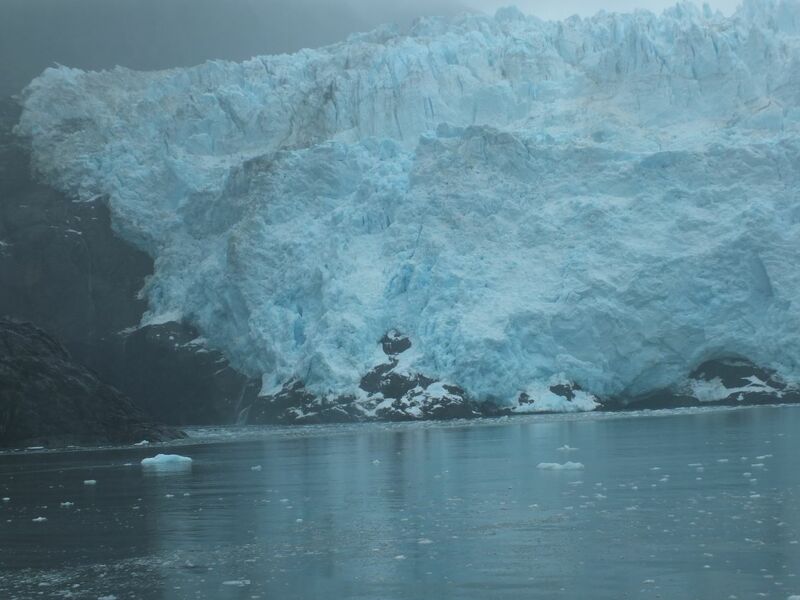 Instead of being white, they often have a blueish tinge like this glacier above. They're also surprisingly dirty when viewed closely, like snow that's been plowed along a road and picked up some of the grime from the passing automobiles. 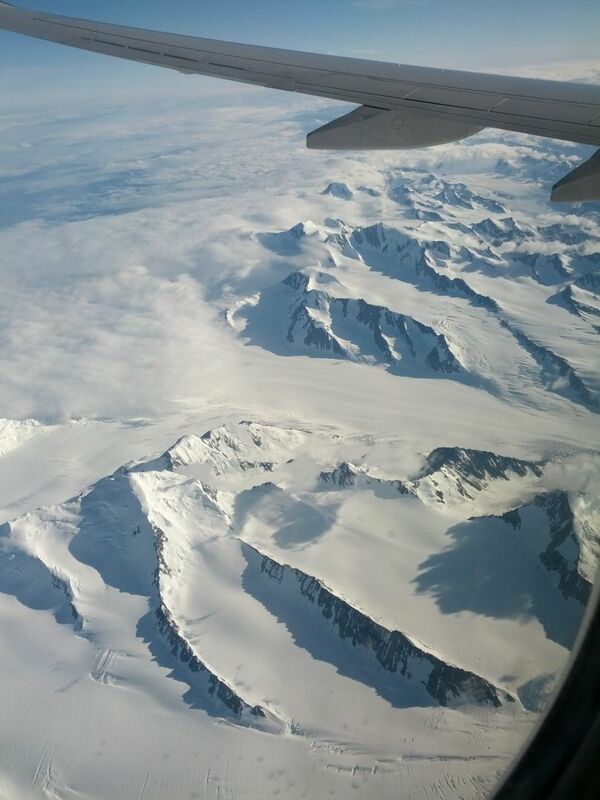 Glaciers aren't static either, for all of their size. 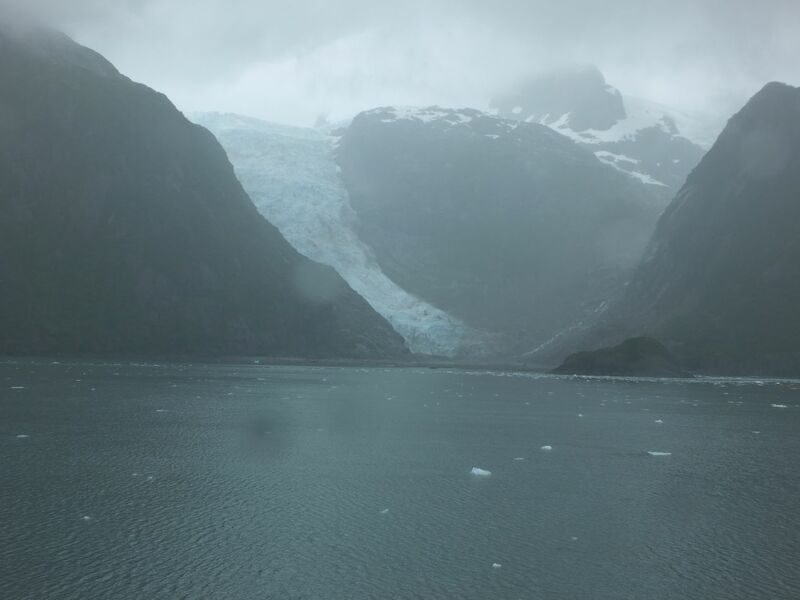 Even in the few minutes that our boat was pulled up here near the Holgate Glacier, several small chunks broke off and fell into the water below. I tried to get a picture of one of them in motion and wasn't able to capture it. Water trickles out from the sides and the bottom of the glacier constantly, as the above-freezing temperature slowly causes them to melt. I imagine this is reversed in the winter, although I've never tried to visit one outside of summer. 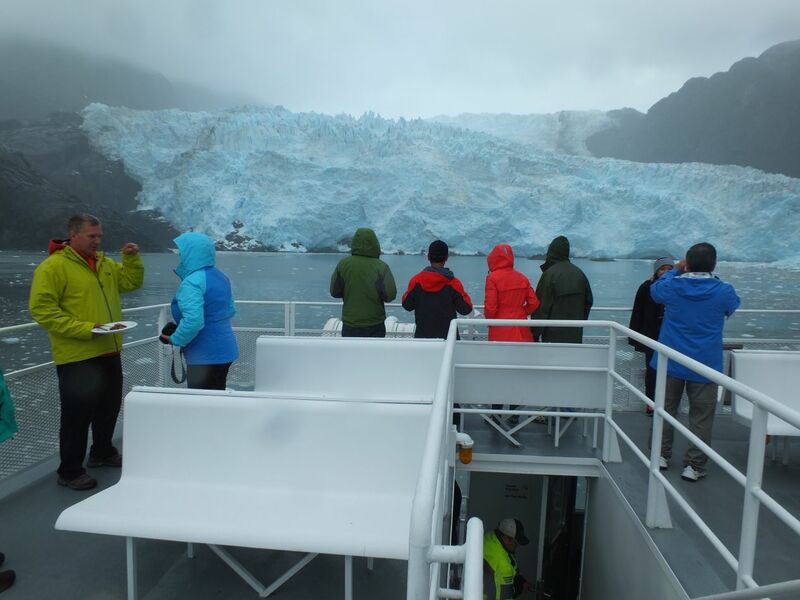 The temperature was also noticeably cooler near the glacier, with everyone on board donning their coats and jackets. All in all, a remarkable sight to see, well worth the queasy stomach on the trip over. 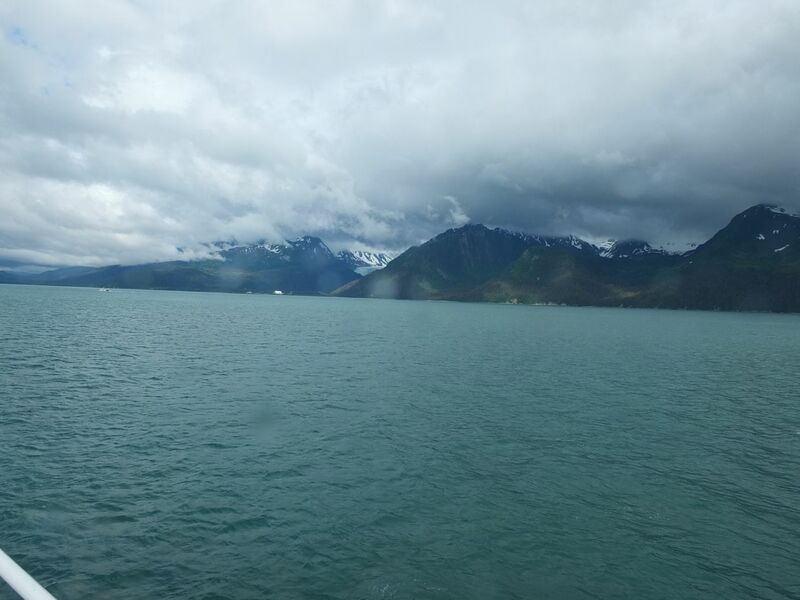 Of course, having traveled all the way over to the Holgate Glacier, our boat now had to return back to Seward again, which would take about 2.5 hours in all. I found a comfortable seat in the bow and did my best to sleep through the passage over open waters, which made the return trip much easier. 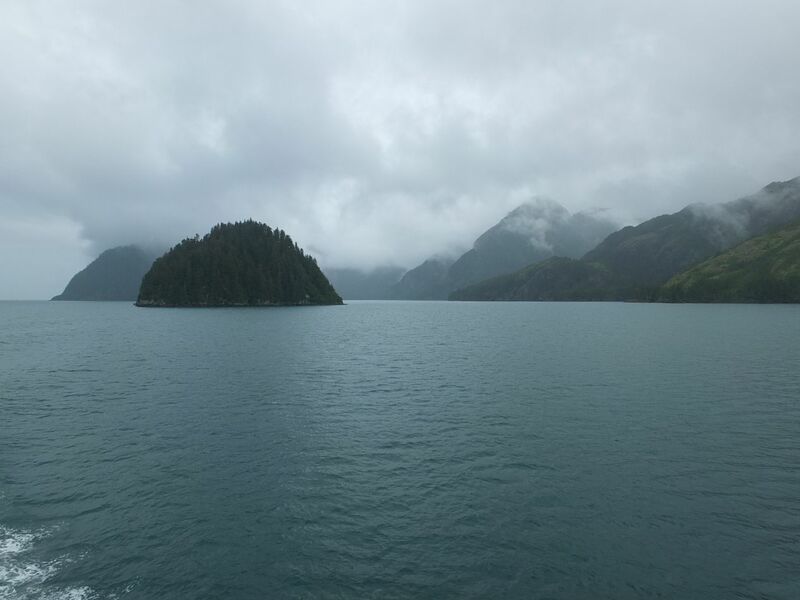 After we were back into Resurrection Bay, I went above deck once more and was able to take more pictures of the scenery. The clouds and rain from the morning had cleared up a bit, and there were a few brief glimpses of blue sky through the clouds. Visibility was much better as compared to earlier, leading to more beautiful views of the bay. As the boat returned back to Seward, I was able to capture a couple pictures of the town as seen from the water, with the buildings dwindling to dollhouse proportions against the mountains rising up on all sides. 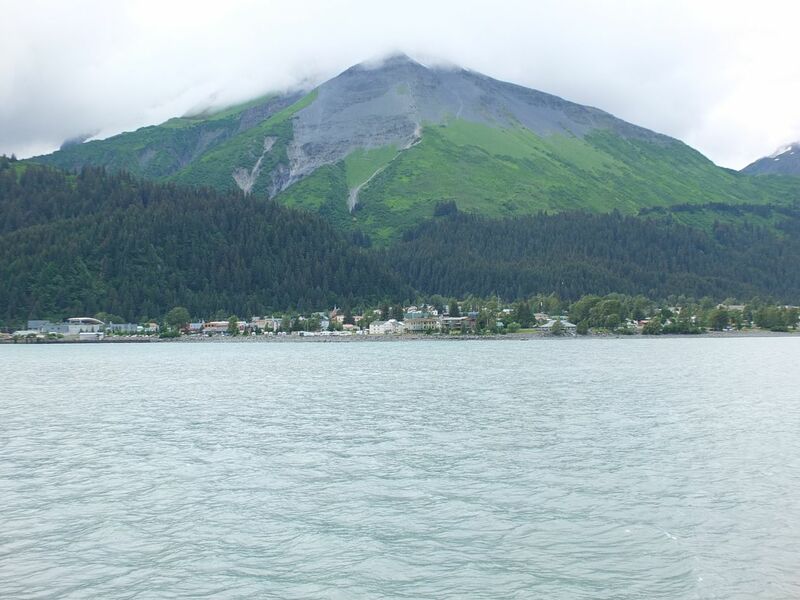 There is apparently an Ironman competition each year that involves racing up to the top of that mountain next to Seward and then coming back down again. I'm a runner myself, but that wasn't a challenge I was eager to try. Those mountains are steep. 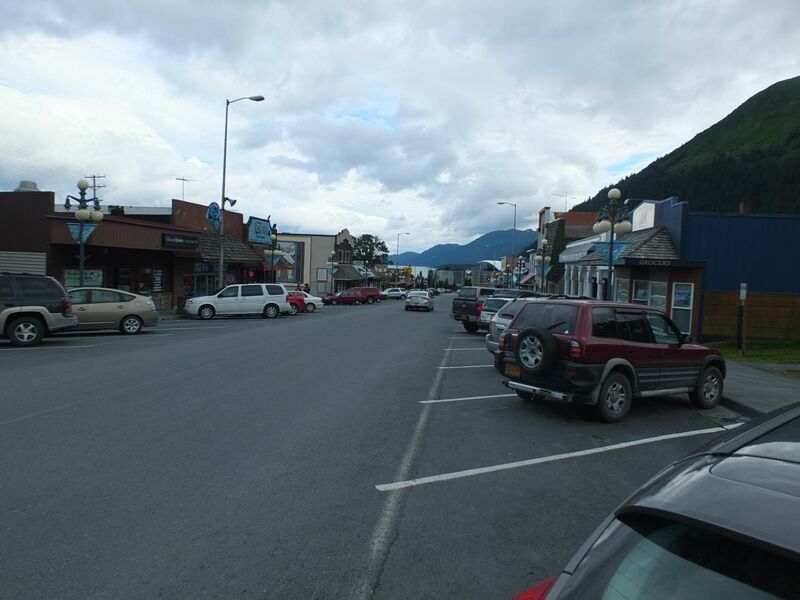 After the boat tour was over, I walked around the rest of the small town and had dinner at the Seward Brewing Company, one of the restaurants on the main thoroughfare. The specialty here was seafood, no surprise, and it looked freshly caught. (Unfortunately I don't eat most kinds of fish, but their offerings did look good.) Then it was off to my hotel for the night, with plans to be up again early the next day for hiking and more exploration.